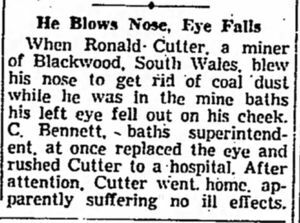 In September 1942, a young miner, Ronald Cutler, had finished his shift, so he blew his nose to get the coal dust out. His eye fell out onto his cheek. A superintendent was able to pop it back in, and Cutler appeared "little the worse for the occurrence." In April 1899, a similar case was reported in the Southern California Practitioner (which in turn got the story from a German-language paper, the Illinois Staatz Zitung). 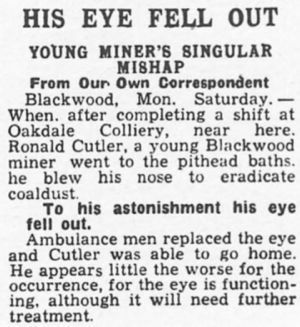 A glass blower blew his nose violently, and his right eyeball came out of its socket. A colleague was able to put it back in, but on the way to the doctor's office the same thing happened again... and then a third time at the doctor's office. There's an old legend that if you sneeze with your eyes open, your eyeballs will come out. Mythbusters says that's not true, noting, "although a sneeze can erupt from your nose at an explosive 200 miles per hour, it can't transfer this pressure into your eye sockets to dethrone your eyeballs. Plus, there's no muscle directly behind the eye to violently contract and push the orbs outward." 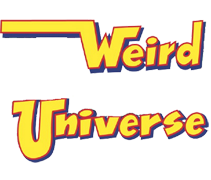 How then do we explain these odd cases of eyeballs coming out when people blow their nose? Update: I just found a third case of eyeball dislocation following nose blowing, reported by Dr. John Tyler of Kansas City in 1888. His patient, upon waking in the morning, "felt the need of a good, hard blow, and said he really was making an extra effort, when to his horror and amazement he felt his left eye pop right out between the lids, and stick!" His wife popped the eye back in, and the man suffered no apparent damage from the incident. There are at least a couple of people today who can voluntarily make their eyeballs bulge outward. Two names that were at the top of the search page were Jalisa Thompson and John Doyle. But their eyeballs don't completely exit the sockets. This reminded me of the scenes near the end of the first Total Recall movie, where exposure to the thin Martian atmospheric pressure made for some pretty swollen eyeballs for the main characters.